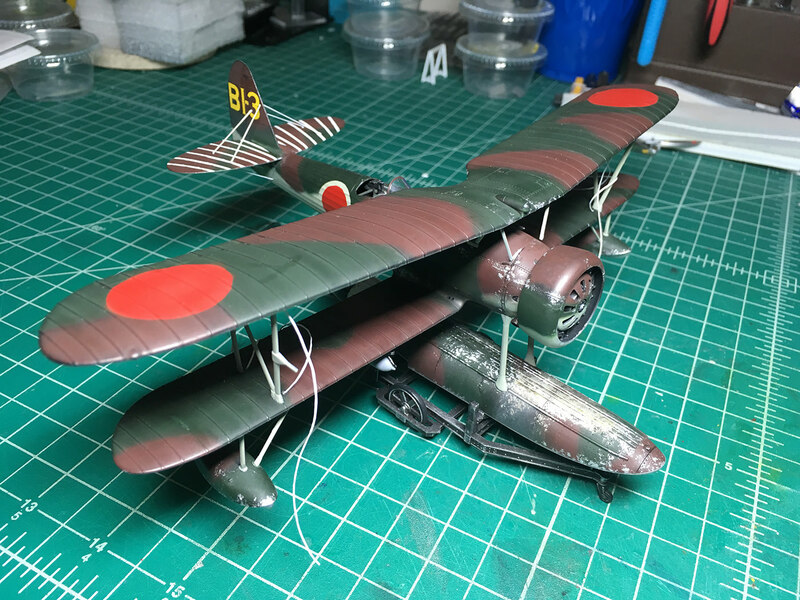 Kicking off my WIP thread for Hasegawa's Nakajima E8N1 Type 95 "Dave." 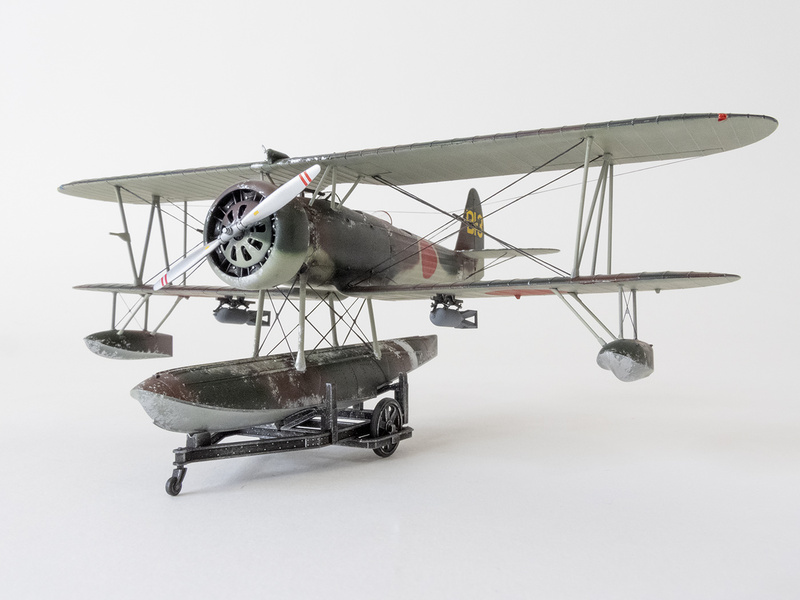 Never built a seaplane before, should be fun. While researching a bit about this plane, I found a cool in-flight picture showing some serious weathering on the main pontoon. And I thought that made a lot of sense, since the mechanics would be walking all over the front of that thing when performing engine work. So I'll be trying to get that sort of effect on this one. Got started on it yesterday, hope you enjoy the journey. 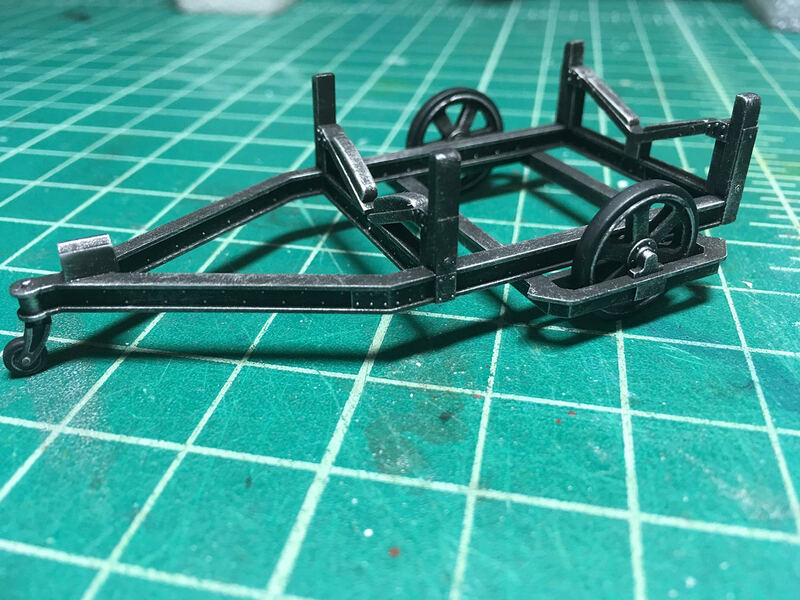 I decided to build up the aircraft dolly first, since it looked super easy. It was. And now I have something to rest the plane in during construction. Not much detail in the cockpit. 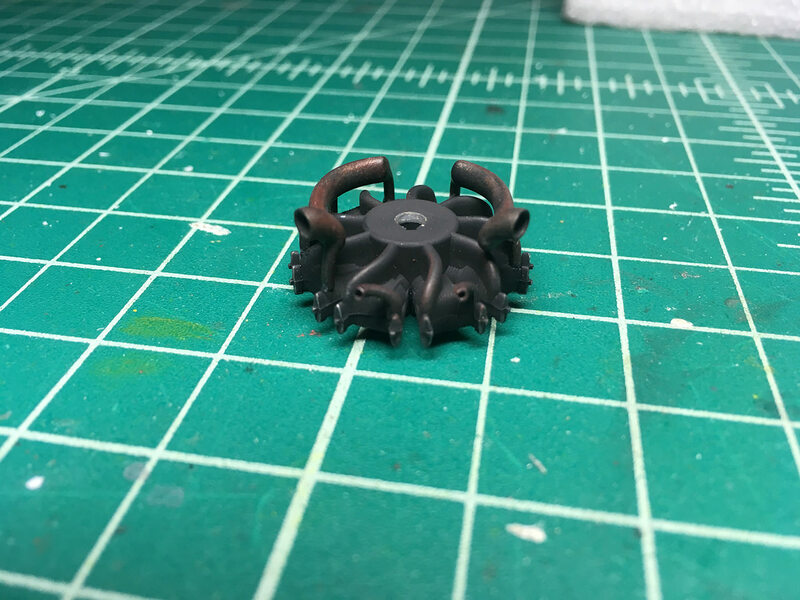 This is an OOB build, so just some basic dry brushing in here to bring out what little detail there is. The cockpit walls were a bit fidly, but give a good a result. That's it for now. Hope to get some good time in on it later today. That is a prime candidate for the hairspray method. 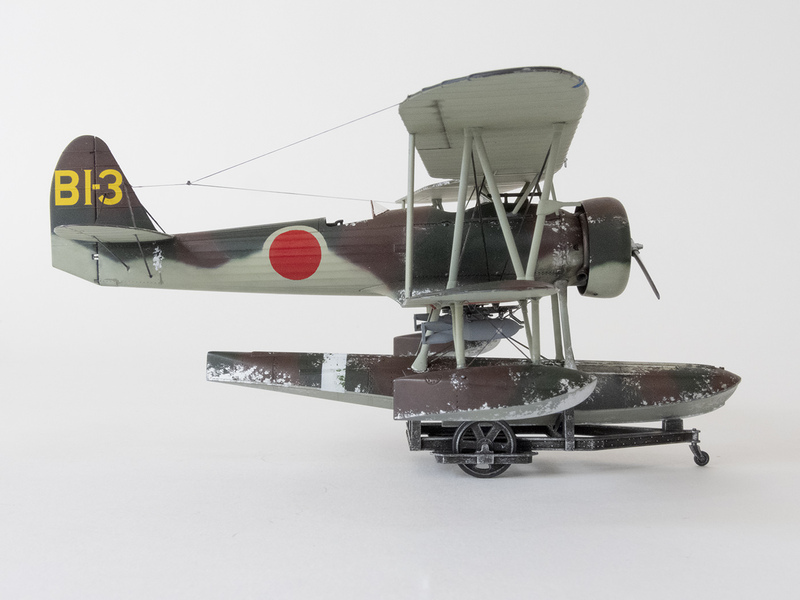 Early in the war the Japanese planes specially the seaplanes had orange/red primer showing thru the weathered paint. The weathered areas in the picture look like NMF so it’s hard to tell from a BW picture and I don’t trust the colorized ones for accuracy. Later in the war lack of primer made the paint flake off really easily. Good idea, I might just give that a try. Haven't tried the hair spray method yet, and I love learning new things. 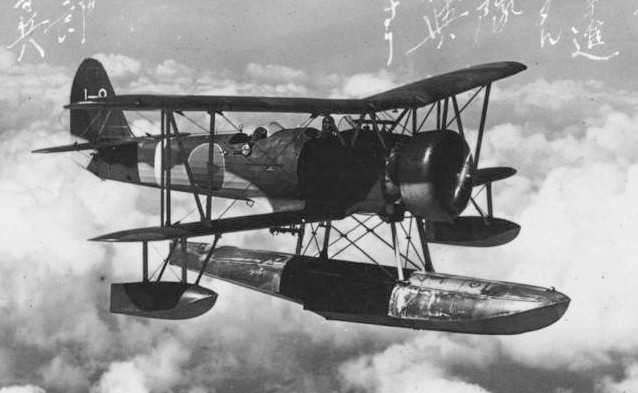 I found some pictures of one of these planes that was severly damaged in a fight with Chinese Gloster Gladiators. The plane made it back to their seaplane tender, but had to ditch in the water. 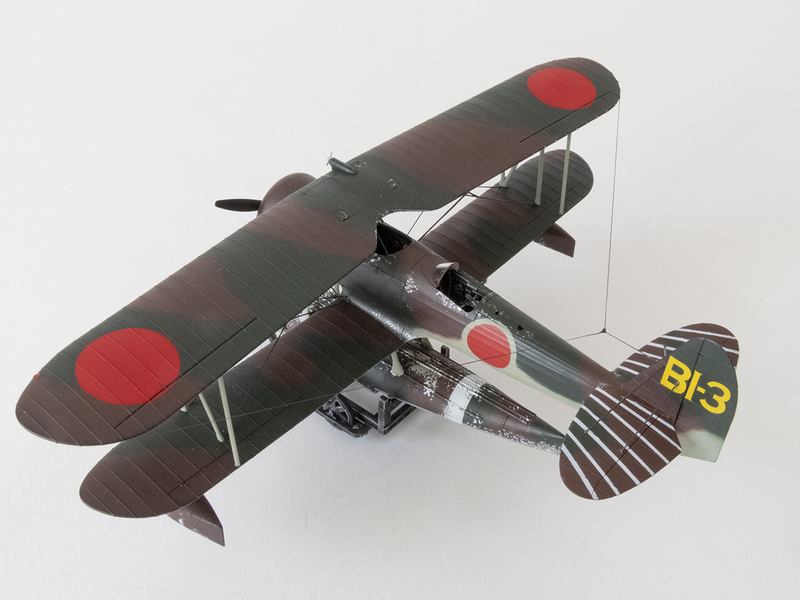 The tender recovered the plane and put it on display in Japan. It's a very cool and unique subject. I don't see many "Daves." Your cockpit and trolly paint and weathering looks fantastic. I found this fascinating film showing the "Dave" in action! 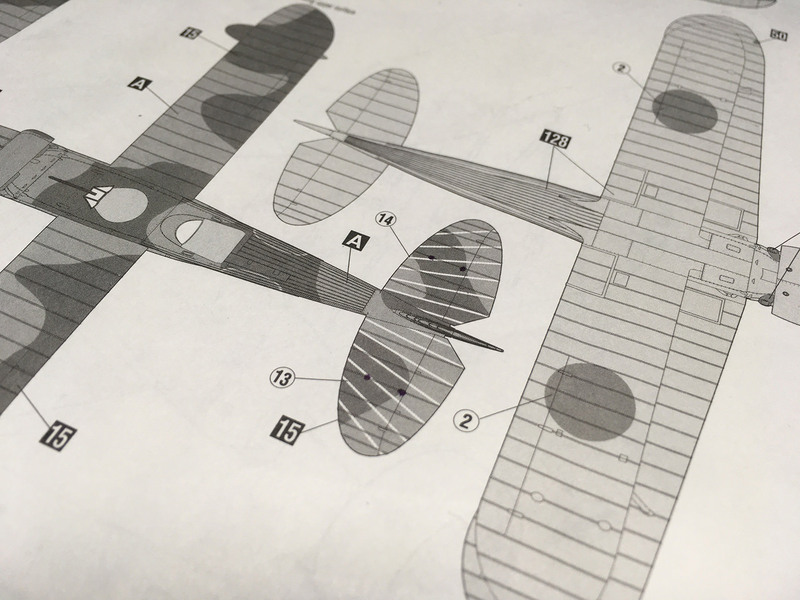 Nice work on the dolly and the plane so far! 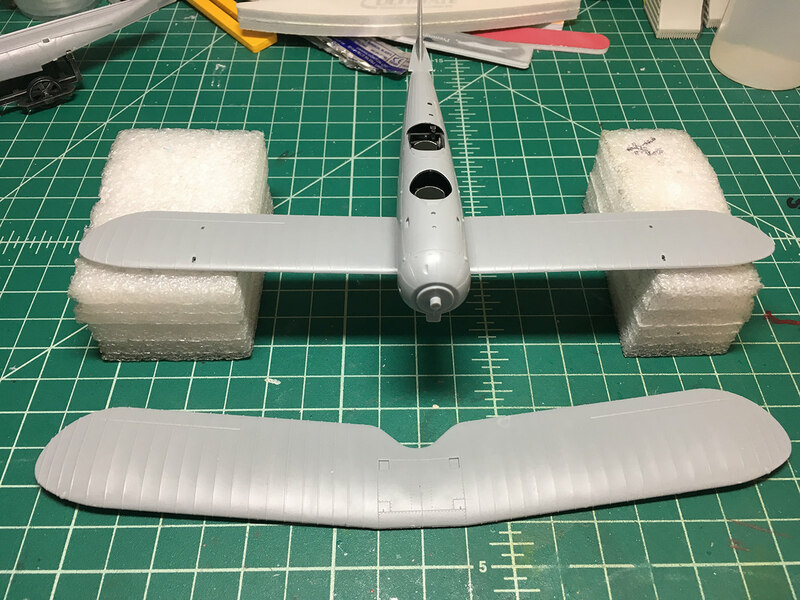 Below are the latest pics from this build. This kit is awesome so far. The fit is exceptional. After viewing the video in my last post, I was discouraged to see that this plane has a lot of wire rigging. The box art doesn't show any of that, and it's not shown in the directions or painting guide. So that's a bummer. I've looked around and found some sources that will help to rig it correctly, but just not looking forward to doing it. 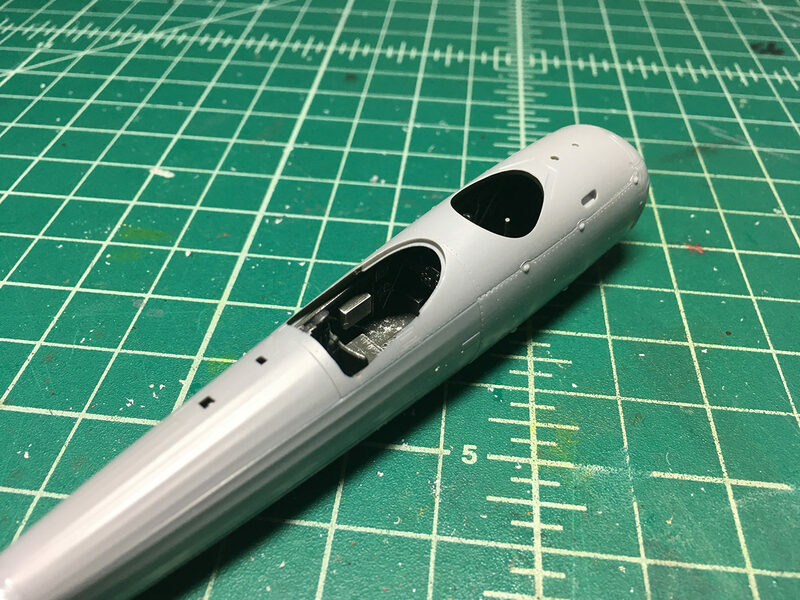 The cockpit tub fit into the fuselage perfectly and the two halves went together without any gaps. And the top of the fuselage sat down on top of it just fine. 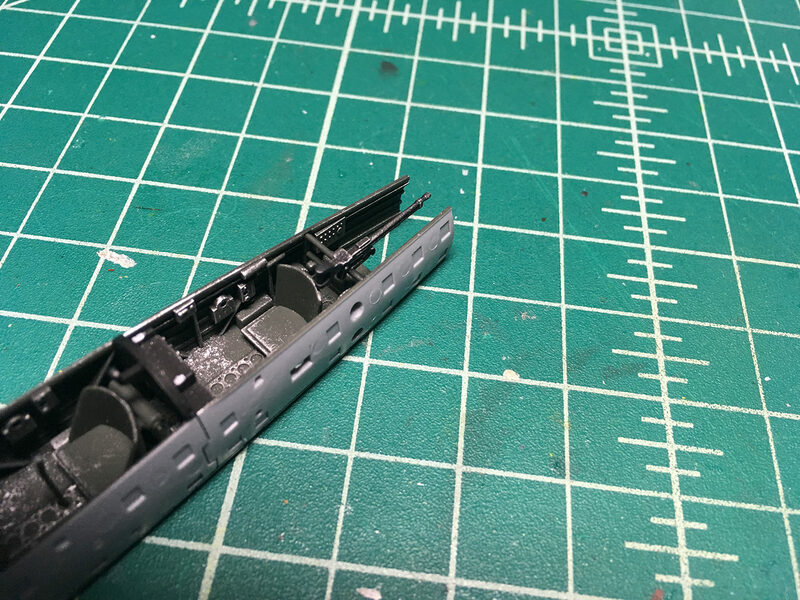 The engine is kind of plain and I didn't do anything other than dry brush some highlights onto it, but I did drill out the four exhaust ports and I'm really happy with the weathering I did on the pipes. 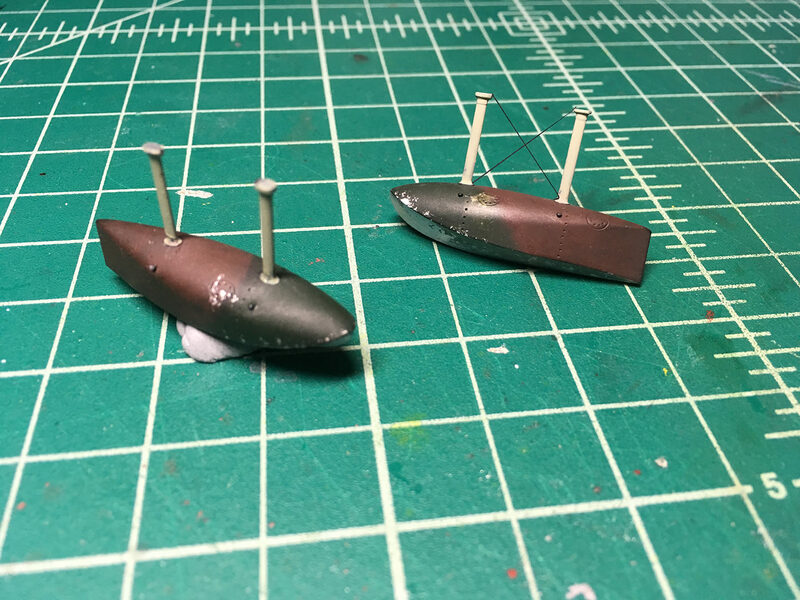 I used a combination of Tamiya Rubber Black and Hull Red, and some black and gray pastell chalk dust. Hopefully get some more done today. 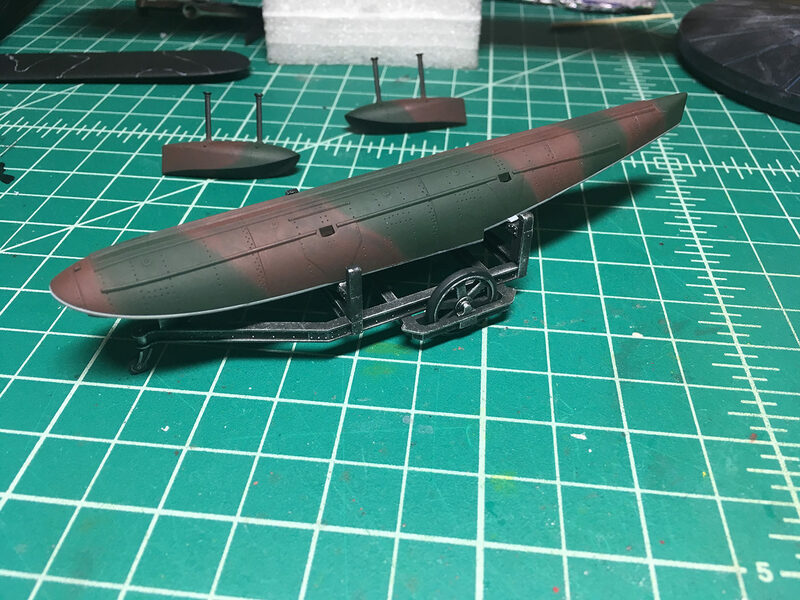 I managed to get all the paint down on the big parts of the plane, except the pontoon. 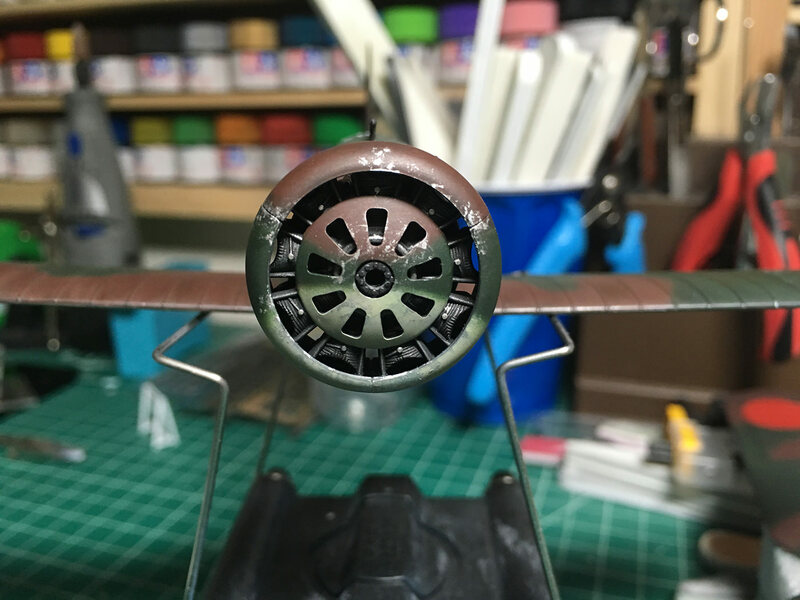 For the underside I used XF-76 IJN Grey-Green, mixed with a little XF-2 Flat White. 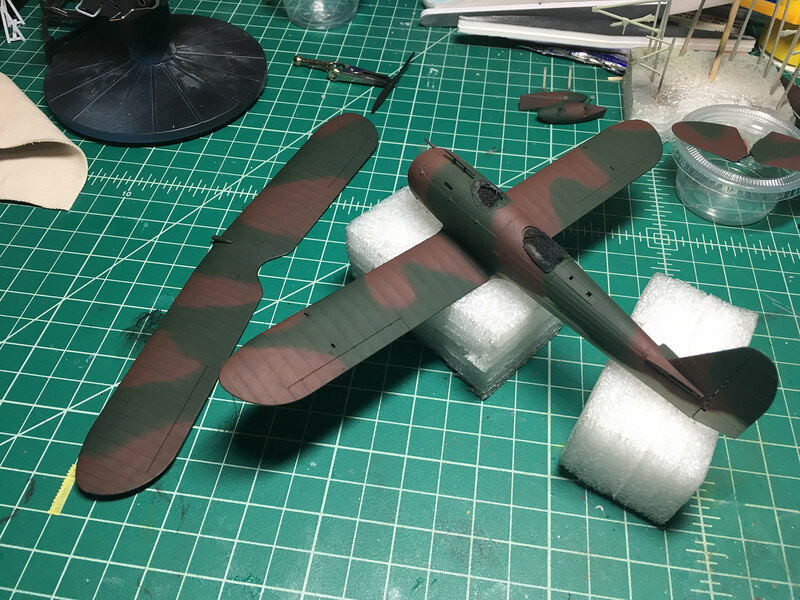 For the camo I used Tamiya XF-11 IJN Green and XF-9 Hull Red. Laid it all down over a black primer coat. 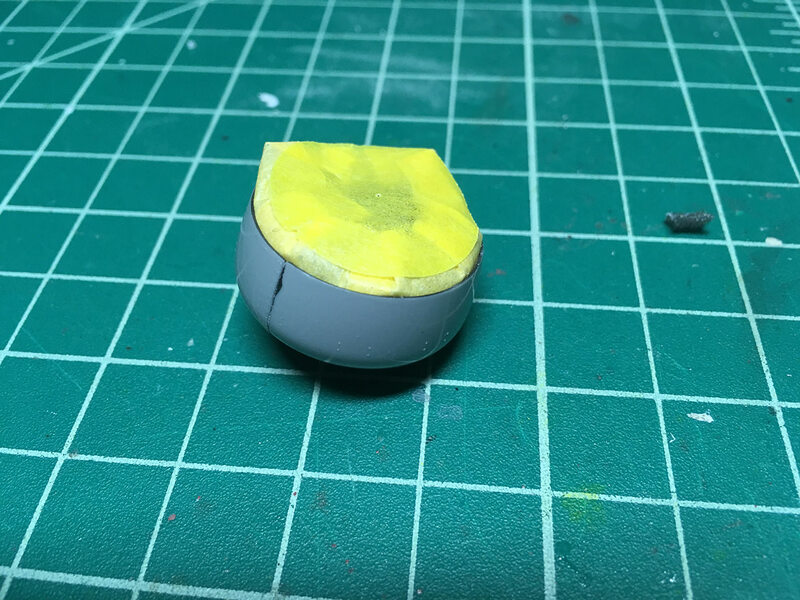 I free-handed the camo because I enjoy doing that instead of spending hours masking the patterns. It results in softer edges but I kind of prefer that look. I screwed up a bit on the horizonal stabilizers. 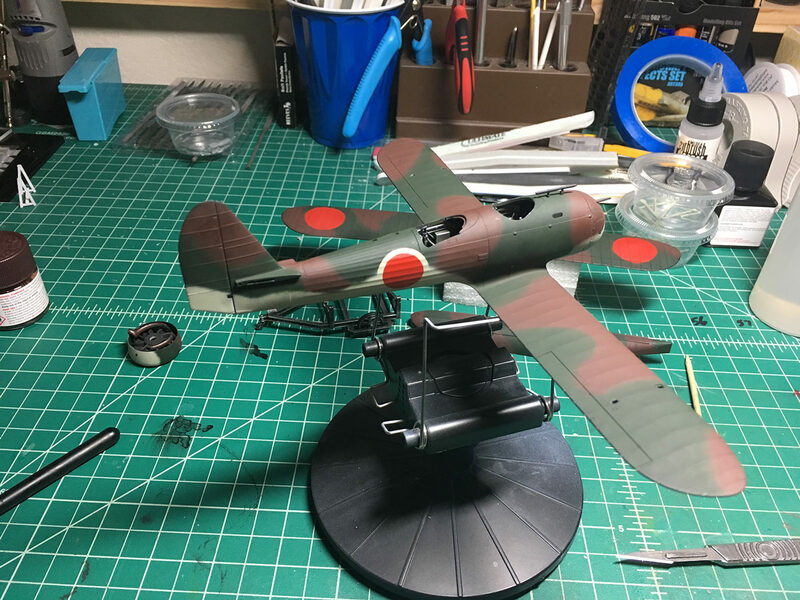 ...that I planned on painting, instead of using the decals. 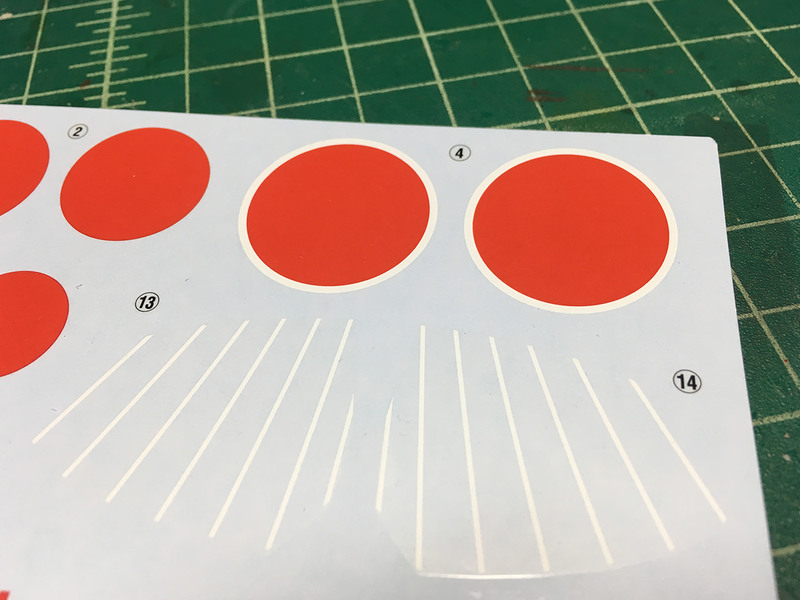 As you can see, the decals are 90% carrier film, covering the entire surface of the stabilizer and elevator. This seems like an invitation for a silvering nightmare. 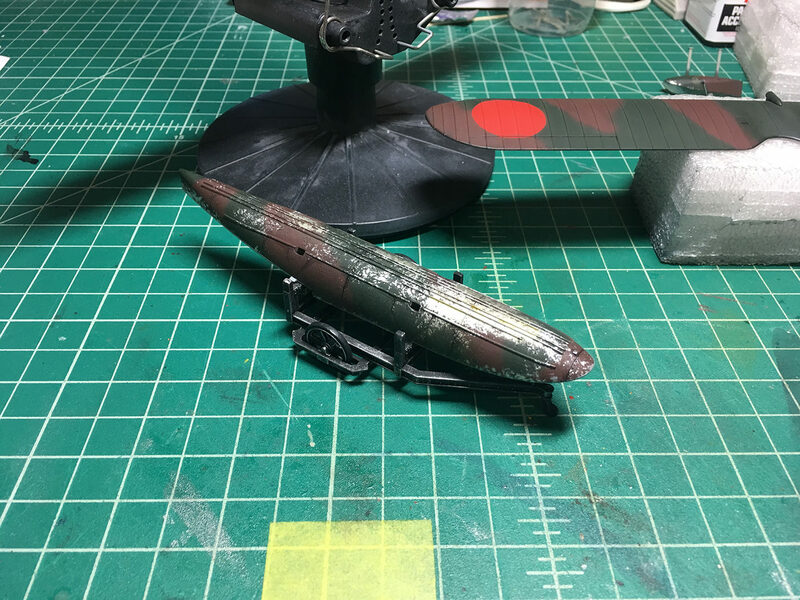 After laying down the camo I realized I screwed up. 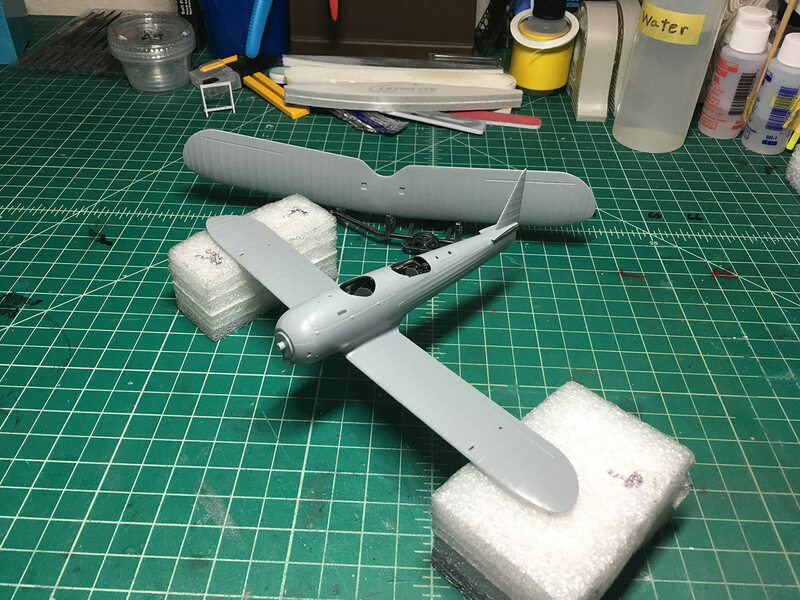 I should have shot flat white over the entire surface first, then used 1mm tape to mask the lines and shoot the camo over that. So the horizonal stabs are a complete redo. Nice work Mark. Cool subject too. I was going to suggest that for the white stripes but you beat me to it...lol. 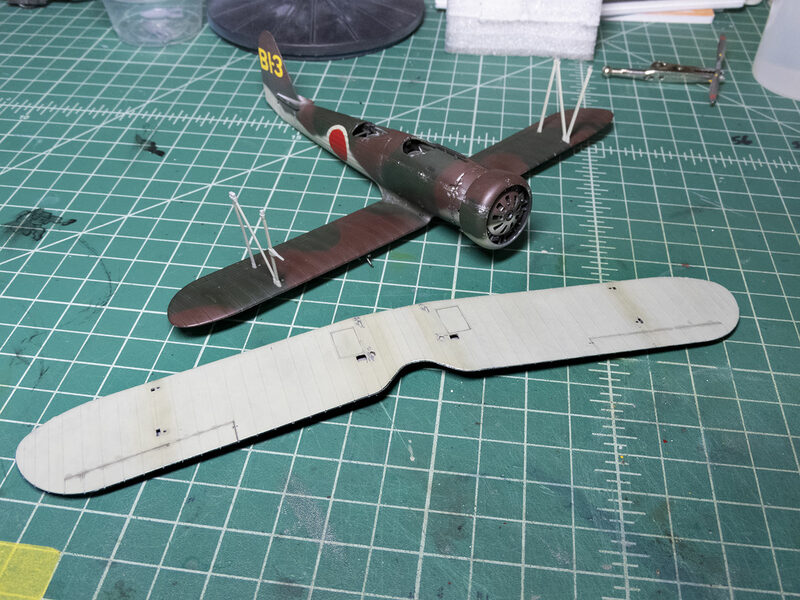 You can slice strips from Tamiya tape too. Use a ruler and an exacto on a sheet of glass. You can still go back and do it. I wouldn't' risk those decals. Looks like a nightmare waiting to happen. I think the 1mm tape will be perfect for this, and save me a lot of sanity. 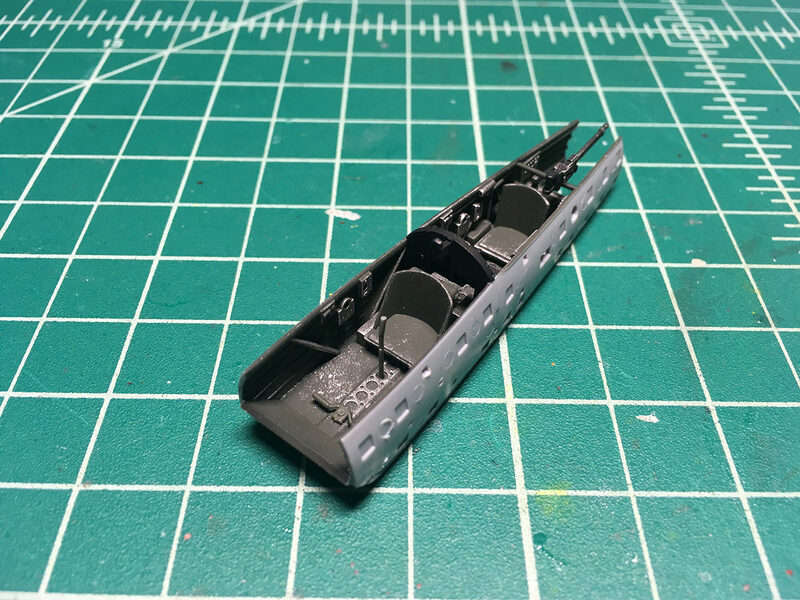 I laid down the camo on the three pontoons. 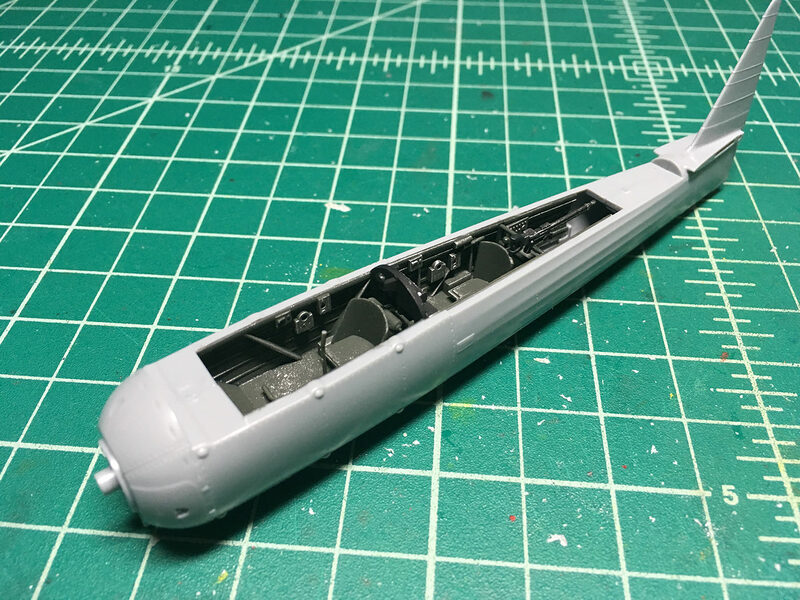 I decided against plasticjunkie's suggestion of using the hairspray technique to chip the main pontoon, simply because I don't want to spend the money. I know it wouldn't cost much, but when your unemployed you have to pick and choose your spending carefully. Plus, I feel real comfortable with sponge chipping, so I'll be going with that technique again. Here's how the pontoons look with their fresh paint. 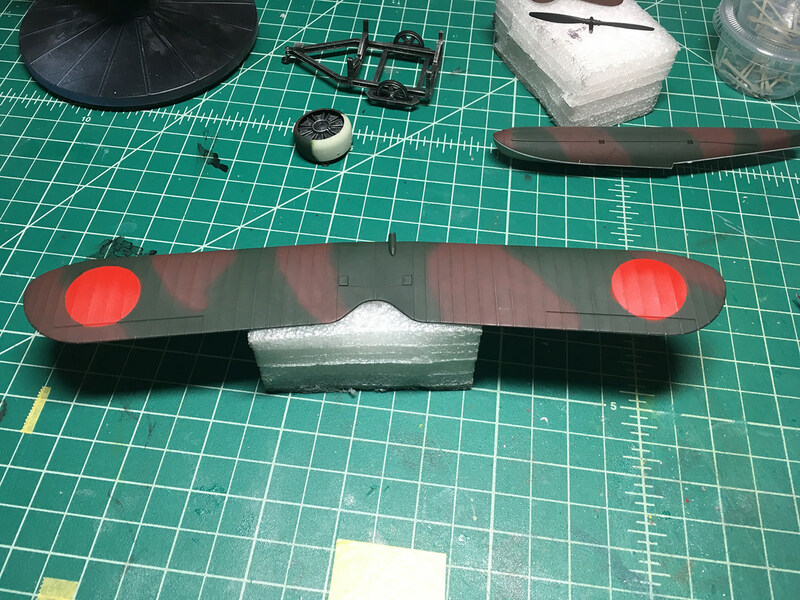 I weathered the underside of the top wing with with some slight staining and streaking using oils. 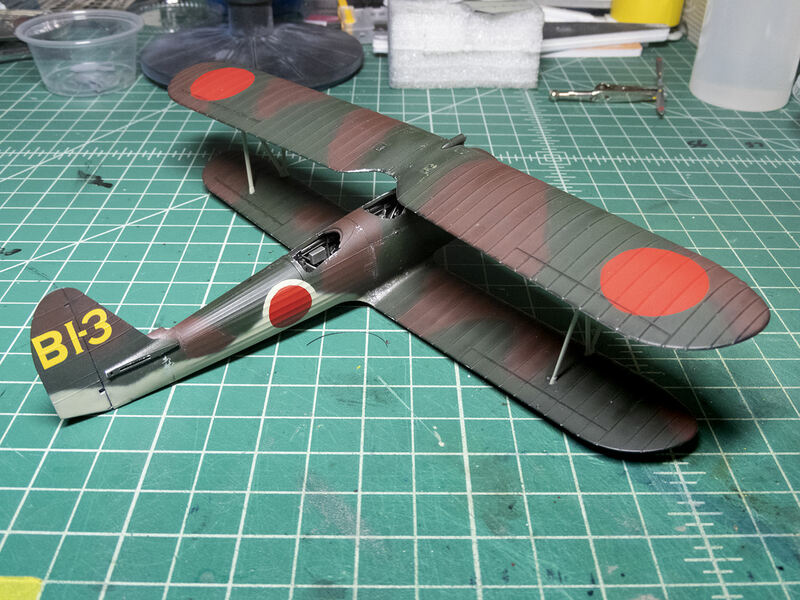 Here, I've painted the Hinomarus on the top wing, and laid camo on the engine cowling. 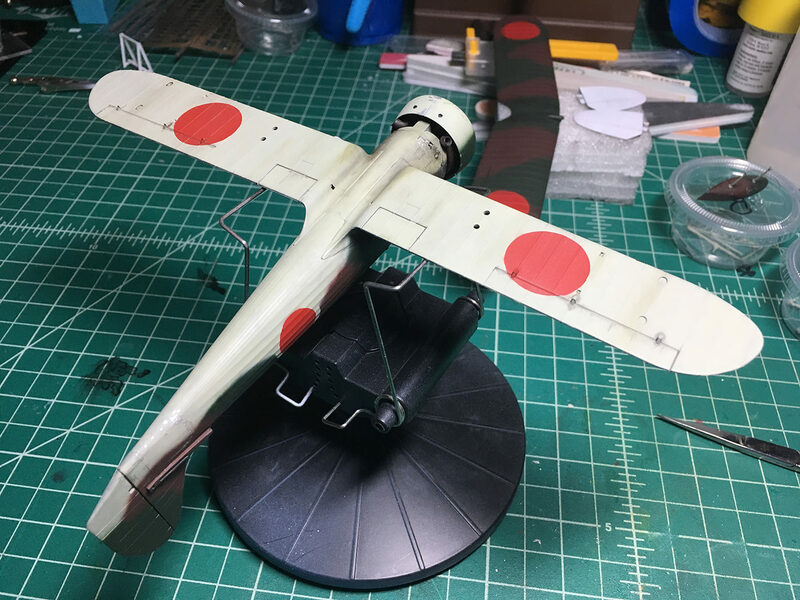 And then painted the Hinomarus on the fuselage. 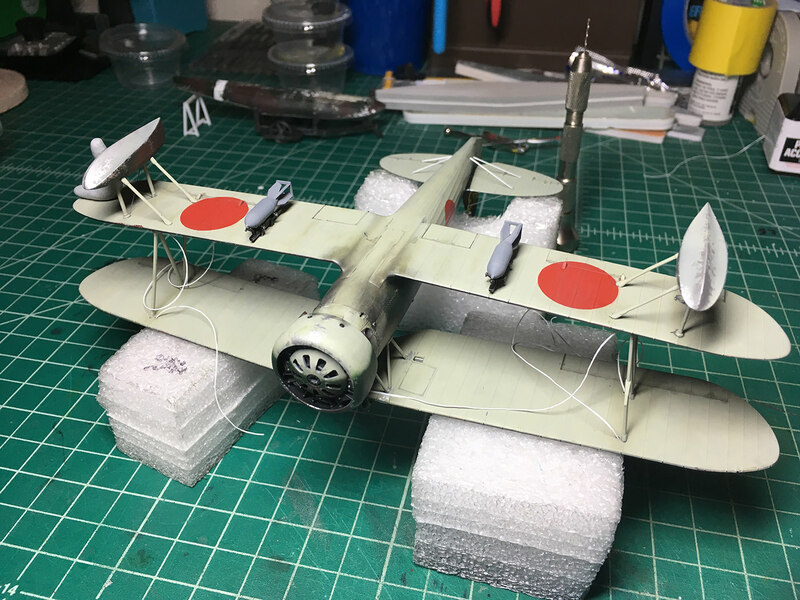 I first had to add a hard circular mask to extend color from the underside up the fuselage since the Hinomaru had that color as an outline. I think that circular mask was slightly too big, so the outline is bigger than I think it should be. But I'll live with it. 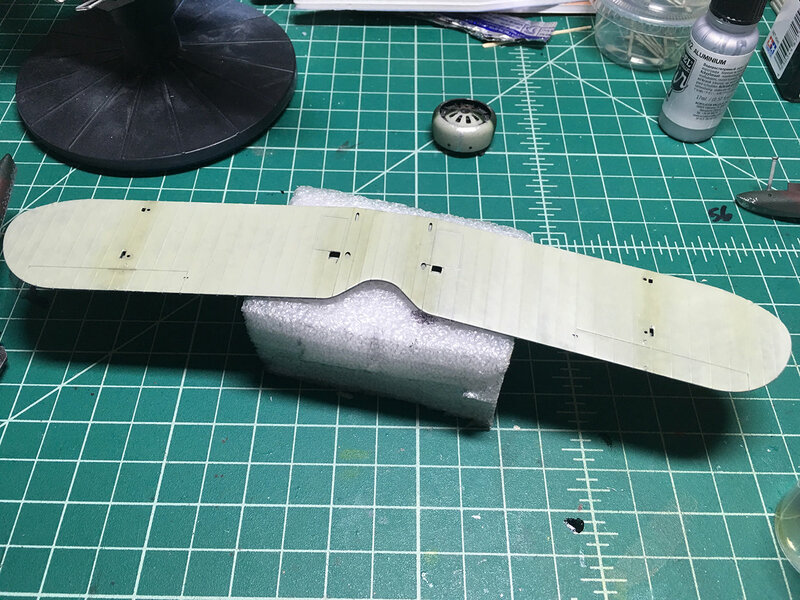 Added some chipping to the few metal panels at the front of the fuselage, and the wing roots before they meet the fabric sections. 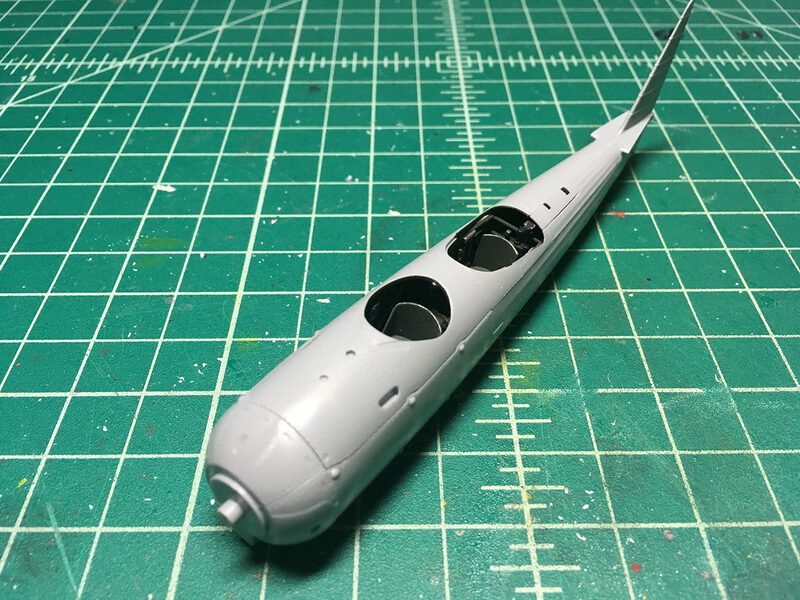 Then I added the engine sub-assembly and did some chipping to the cowling. 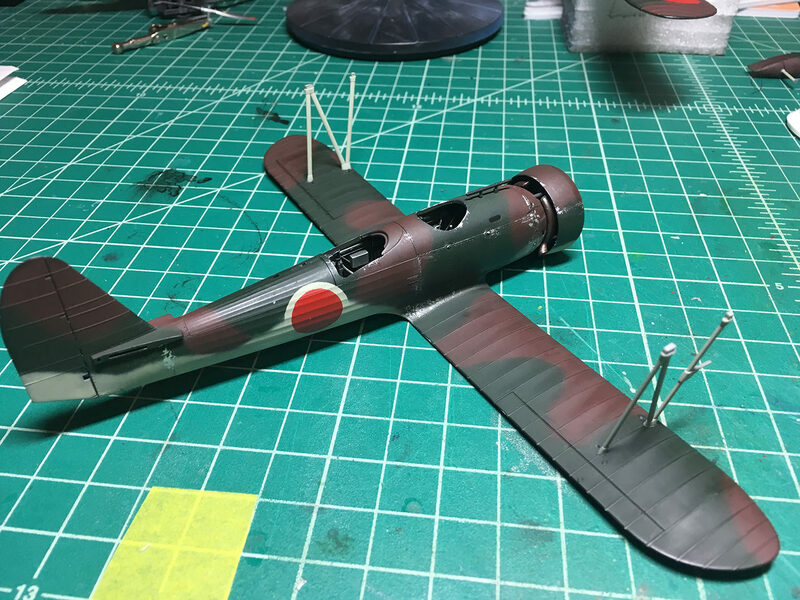 Finally, painted the Hinomarus on the underside of the bottom wing, and did some exhaust staining on the fuselage and wings with oil paints. 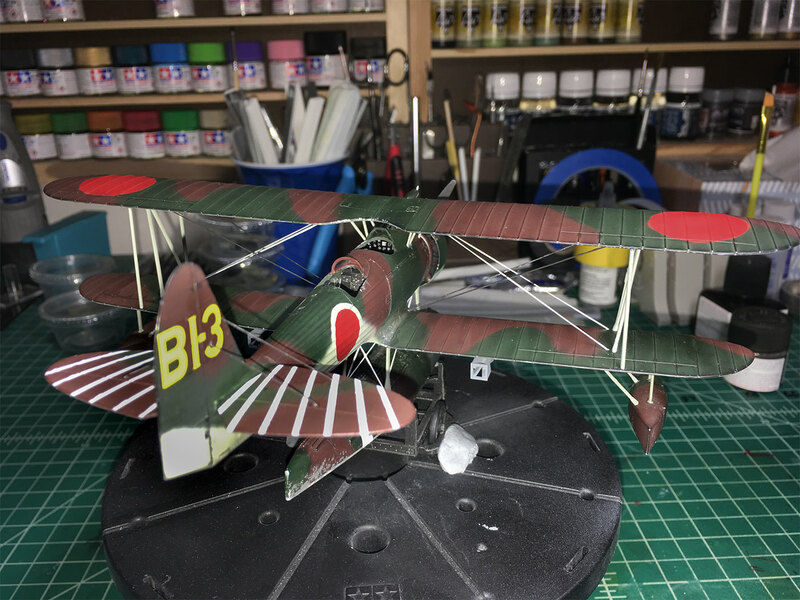 In the background of this last pic you can see the horizontal stabilizers have been repainted in flat white, awaiting the masking strips for the deflection lines, then I'll redo the camo over that. 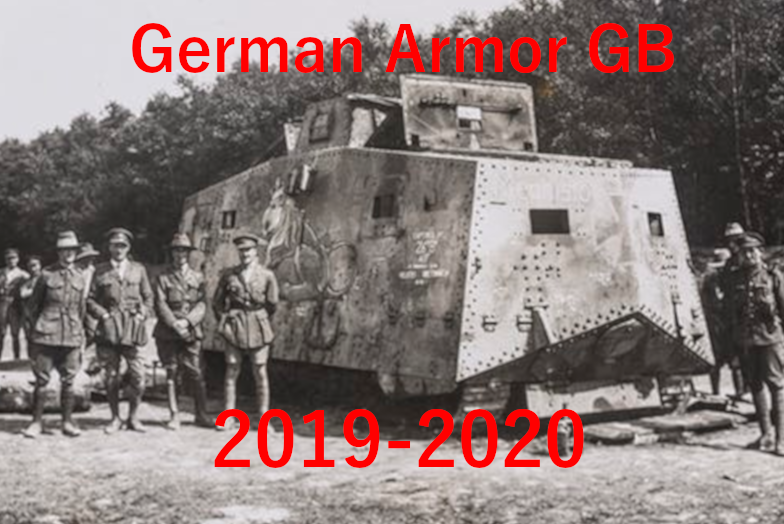 Should work out well. Stunning....good move painting in the meatballs. I dig the cowl chipping too. 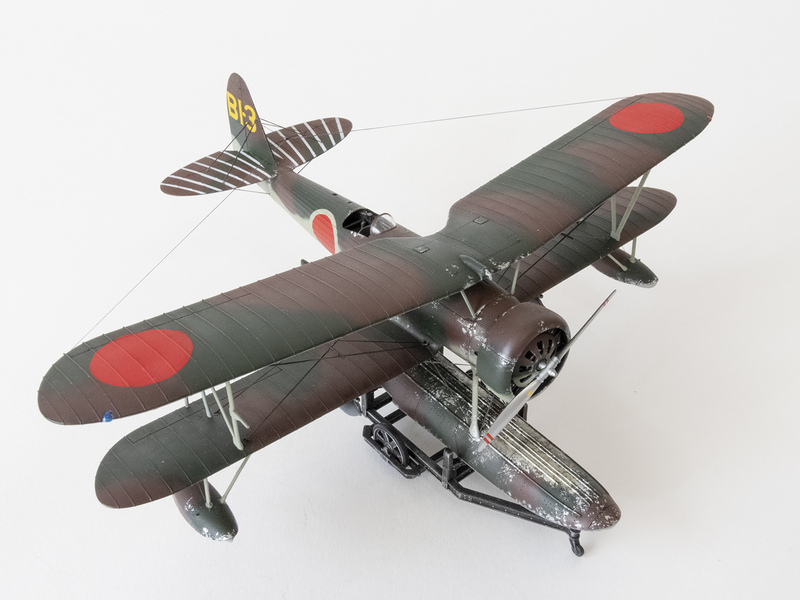 I've had nightmare problems with PE rigging on two kits (Tamiya's 1/48 Fairey Swordfish and Accurate Miniatures 1/48 F3F-1) but they were due to my lack of skill more than the design of the kits. Nonetheless, reading the section about the PE rigging in the above linked URL might save you some headaches. Thanks for the link Mike. That was a good article He was using an after-market PE set, that I don't have. So I'll be using EZ-Line for my rigging. 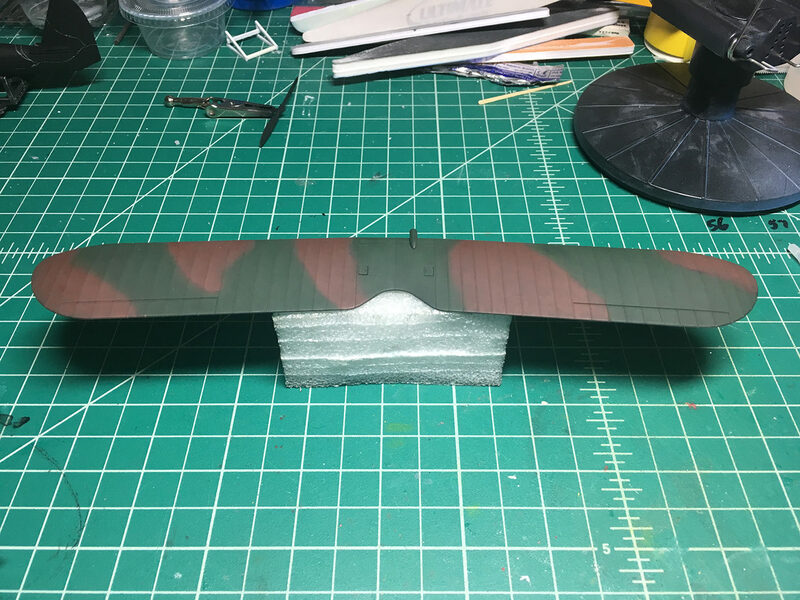 He also has a rudder for the main pontoon that didn't come with the kit. I think it looks cool, but I'm not going to spend the money for it. 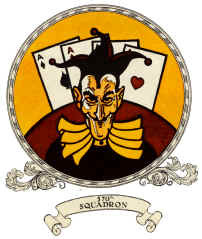 The small pontoons. Only one was rigged when I took the picture. 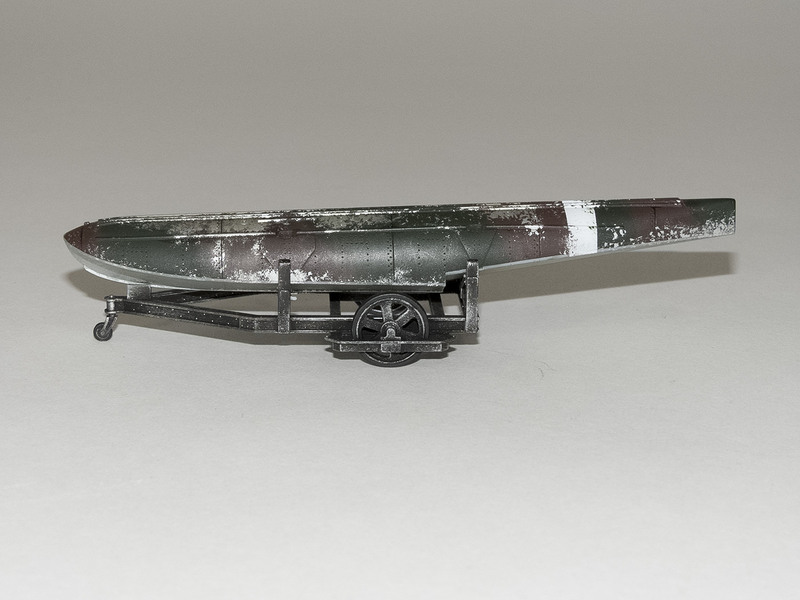 The big pontoon after chipping and weathering. 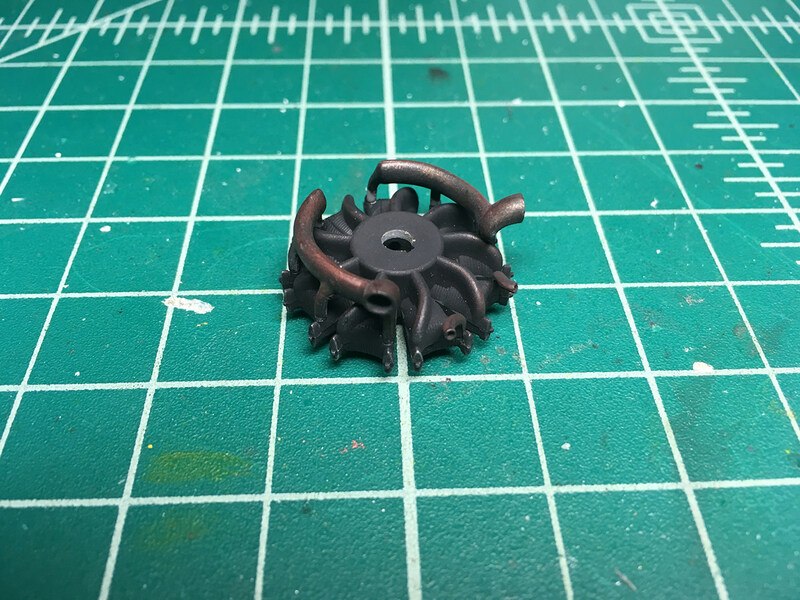 I used the sponge technique with Vallejo Aluminum, followed by several rounds of oils for some discoloration and streaking. Here is the final pontoon, with painted white stripe instead of decal. 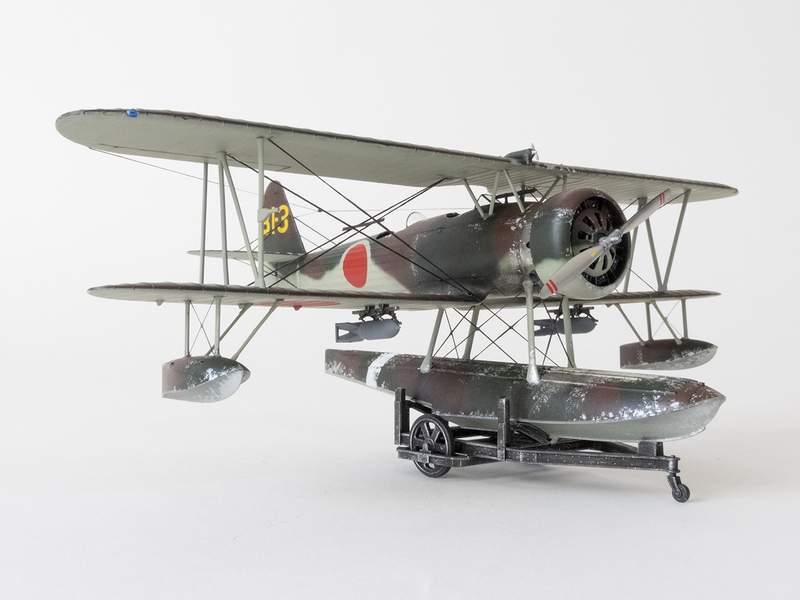 I forgot to take a picture of it before I closed up the pontoon, but I added a large fishing sinker to the nose of the pontoon, because I had read that without it, the plane would tail-sit when placed on the aircraft dolly. Kit comes with a little part to prop up the back, but I would rather not use that. 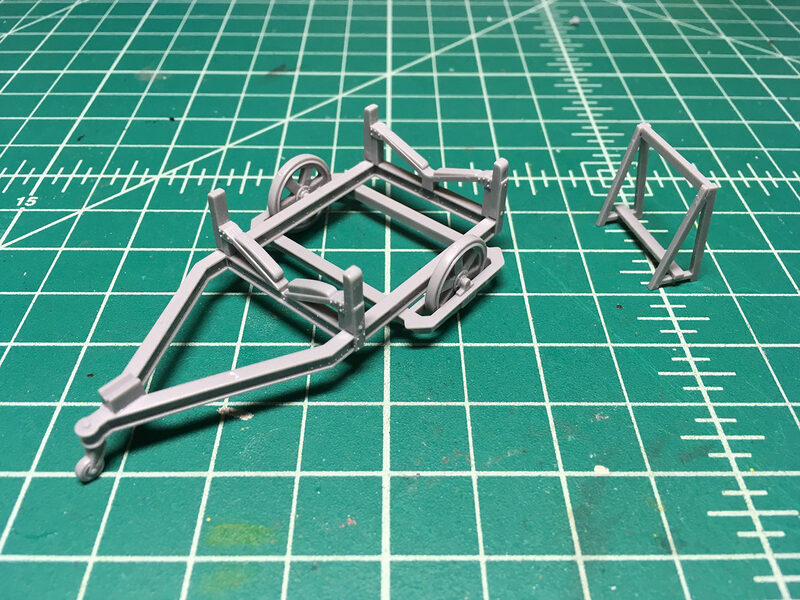 Added the interplane struts. 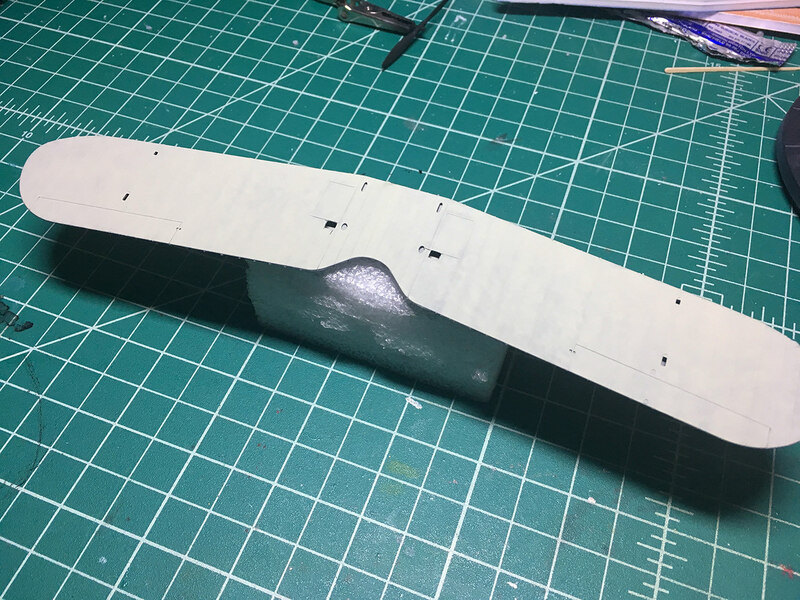 I dry-fit the top wing in place and only applied glue to the bottom of the struts, so they would set at the correct angles. Then when the glue was set I removed the top wing again so I could start with placing rigging. 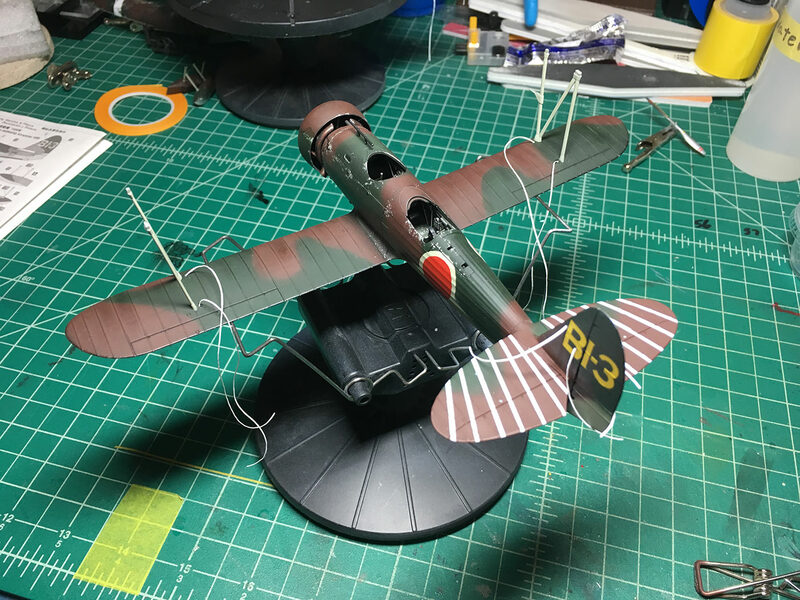 Also added tail number decals. Here you can see I've attached the horizonatal stabilizers and started rigging. The painted white lines turned out okay. 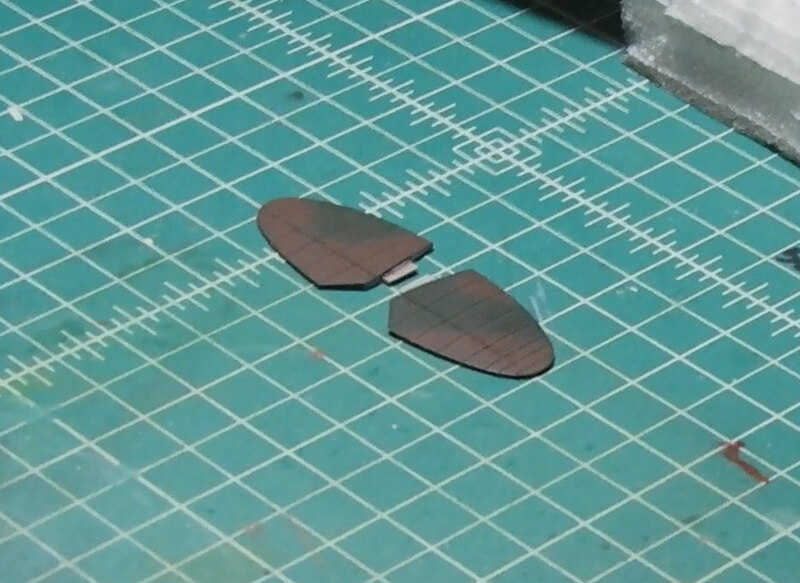 There's one wonky bit on the right stab, but it's not too noticeable. I kind of messed up the order of things next. 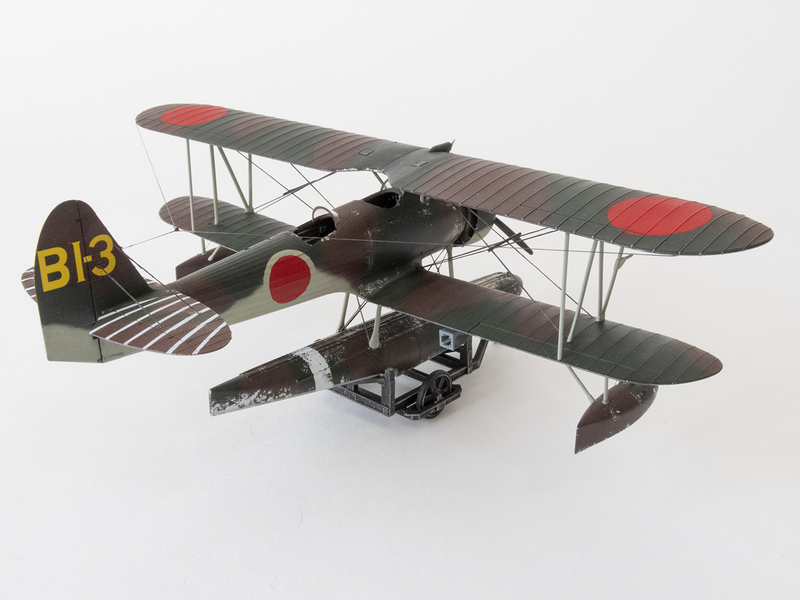 I attached the top wing (affter setting the rigging attachments on it) and that worked out fine. 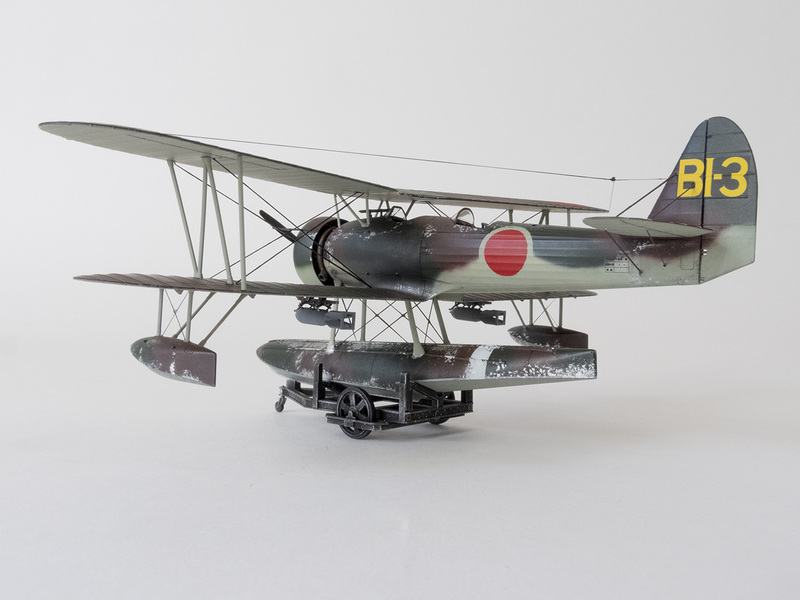 But then I added the outrigger pontoons and the bombs to the lower wing. I shouldn't have done that, because now it is quite a bit more fragile when handling, which will probably make the job of rigging even more difficult. Well, we'll see how that goes. The tail rigging is done, you can kind of see it in this pic. Hoping to get the rigging done today, then attach the main pontoon tomorrow. More rigging after that. Ugh. Looking really good! That was an awesome video. 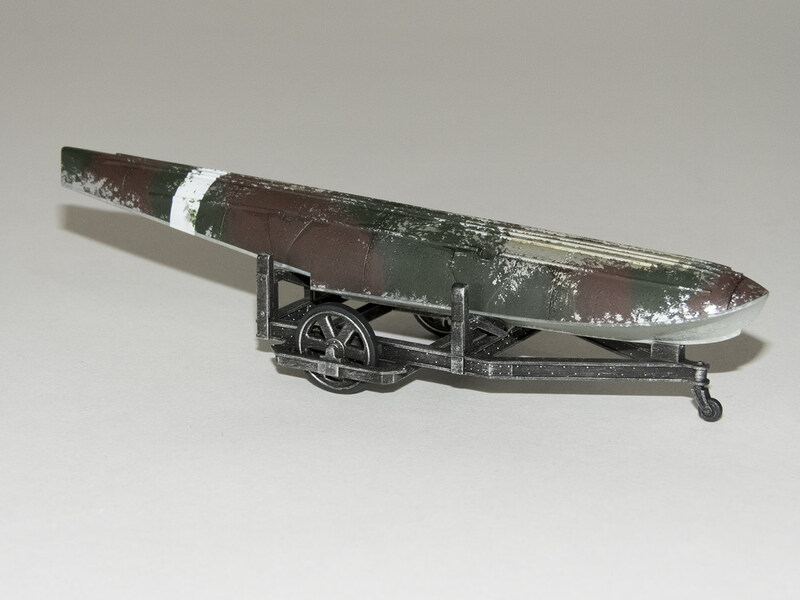 The launching on the ramp would make a cool diorama. That's a neat model, and you are doing a fine job. I went through a floater phase a few years back, they are nice subjects. I would imagine that the center float was also subject to a lot of oil and fuel dripping, something most aircraft can't do to themselves. Great job there on the camo and paint chipping Mark!!! And I'd go with the EZ Line for rigging too, the PE stuff is a pain to work with IMHO. That is some nice weathering and painting. I agree with others, EZ Line is the way to go. Well I finally dealt with the rigging, and finished this bird up. 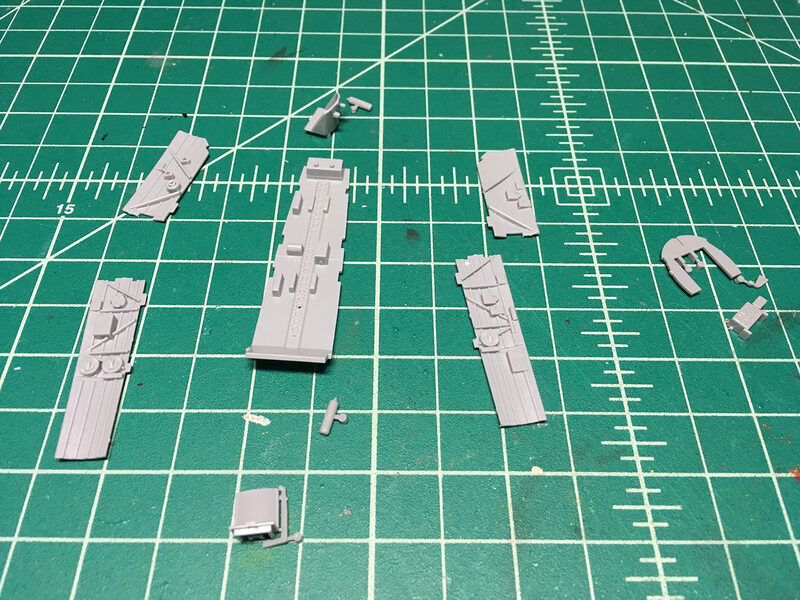 Here the plane and main pontoon have been mated together and the rigging project is about half done. And here the rigging is all completed. Sorry I don't have more pics of the process, but I was so focused on it while doing it I didn't think to stop to take pics. I had two types of EZ-Line, the light and the heavy. So I used the light on the small pontoons and the heavy everywhere else. All the photos I've found of the "Dave" showed pretty thick rigging, so the heavy line seemed to fit well. 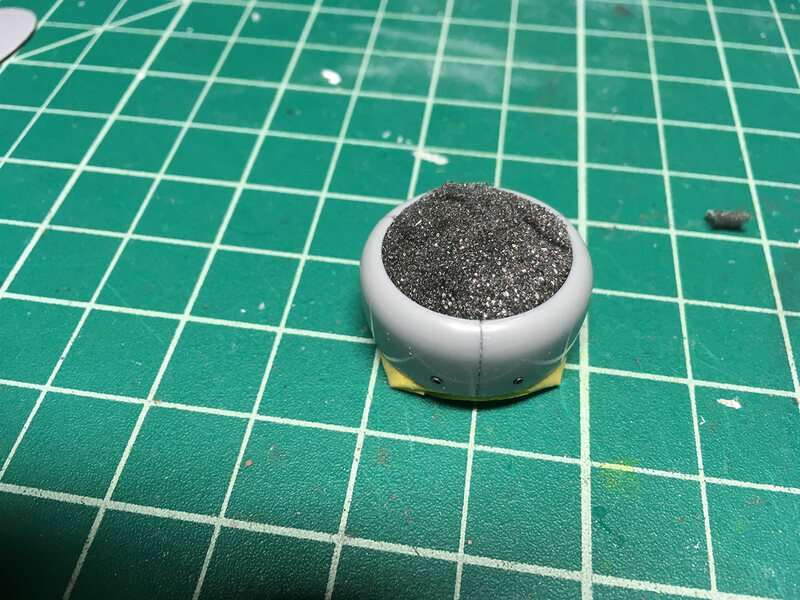 The heavy EZ-Line is white, and I thought it would be easy to paint it a dark metallic color. But it proved to be a hassle. In the future I will buy black line instead. 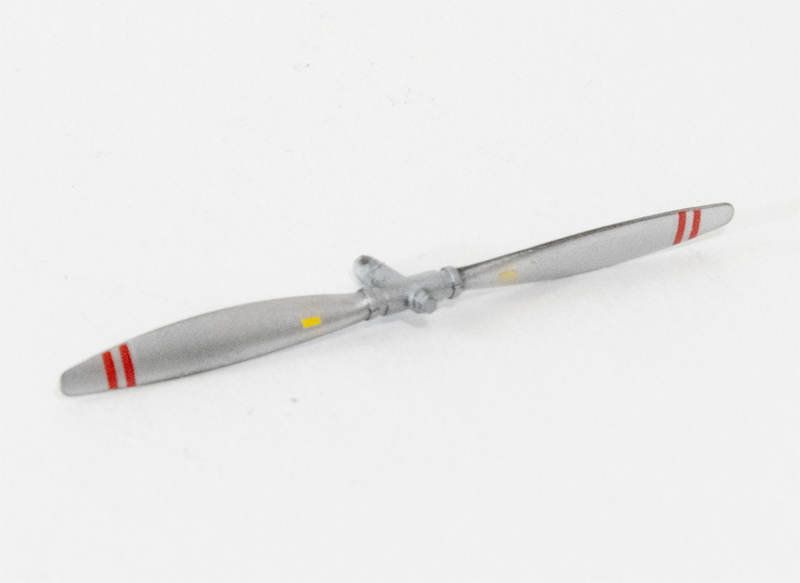 Here's a picture of the propeller, prior to installation. 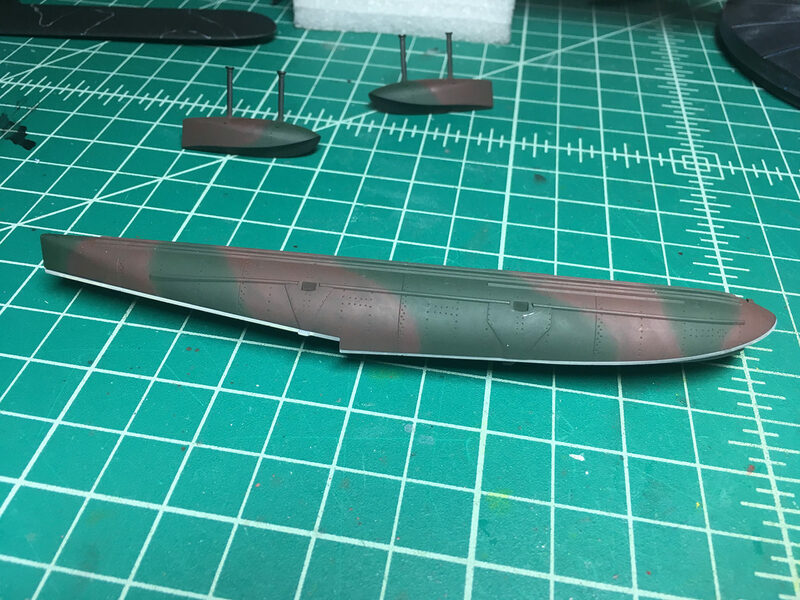 I toyed with the idea of painting the red stripes, but decided to go with the kit's decals. They turned out fine. 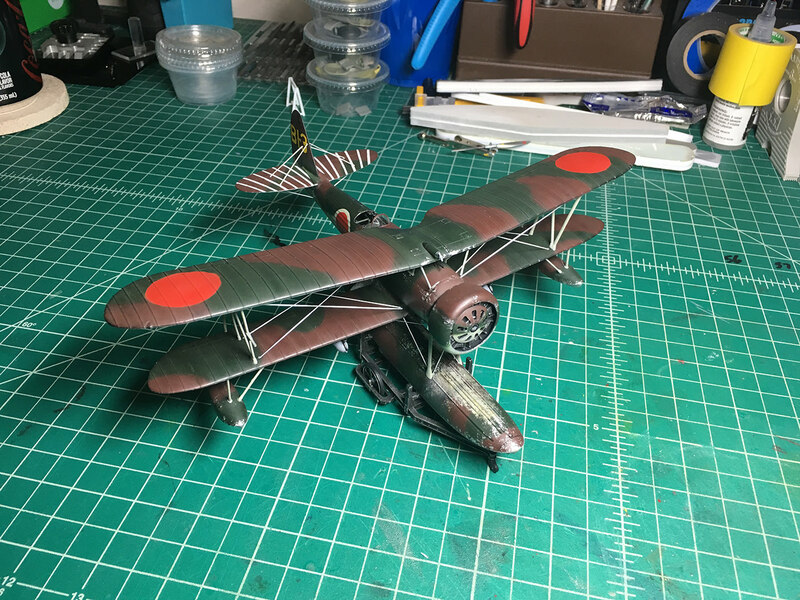 Here are my final pics of the plane. 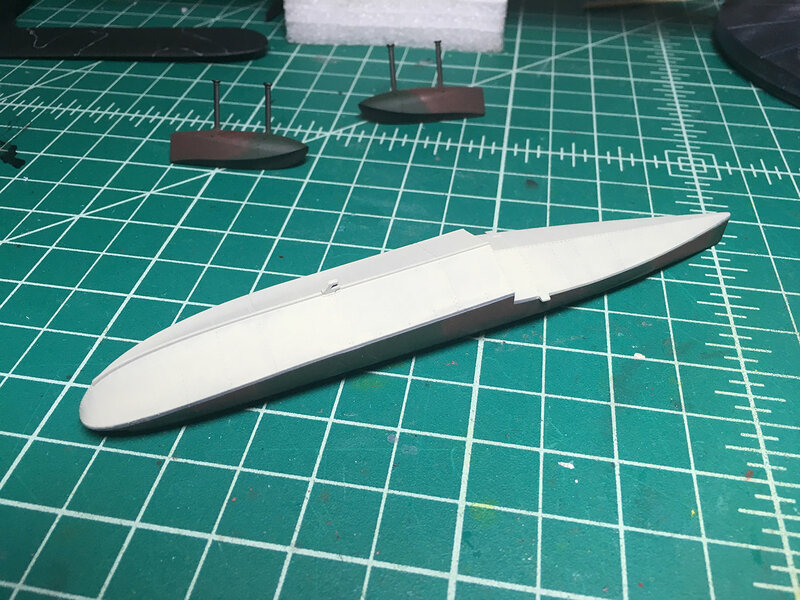 The last touches I put on it were a couple of small bits of scrap plastic for the rigging fences, fine EZ-Line used for the radio wires, and small blobs of white glue on the rigging intersections on the pontoons. 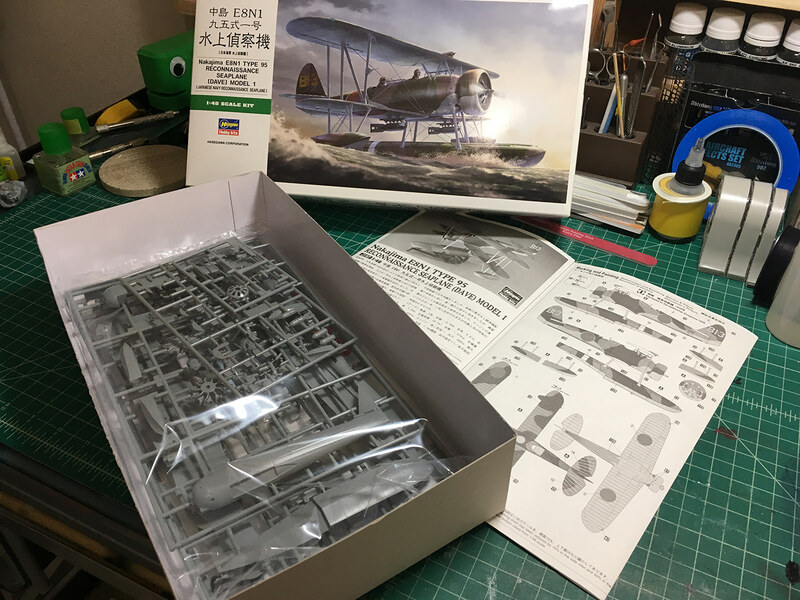 Final thoughts: I really enjoyed this Hasegawa kit. The fit was terrific and the build went smoothly. My only gripe with the kit is the total lack of rigging information. Even down to the box art and instructions, which don't show any rigging at all. 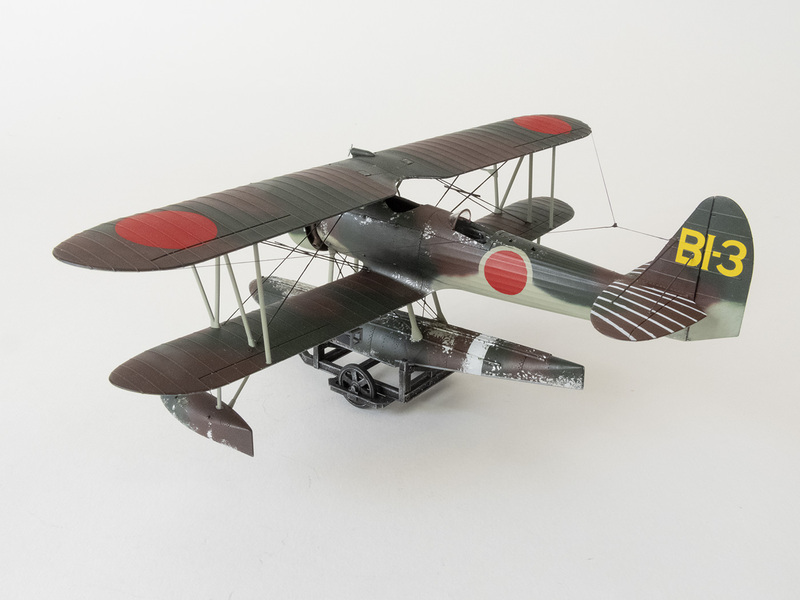 I only learned it had rigging when I researched the plane. Let me know if you have any questions about this kit. That is just fantastic work! Very inspiring. That is beautiful workmanship, Mark. 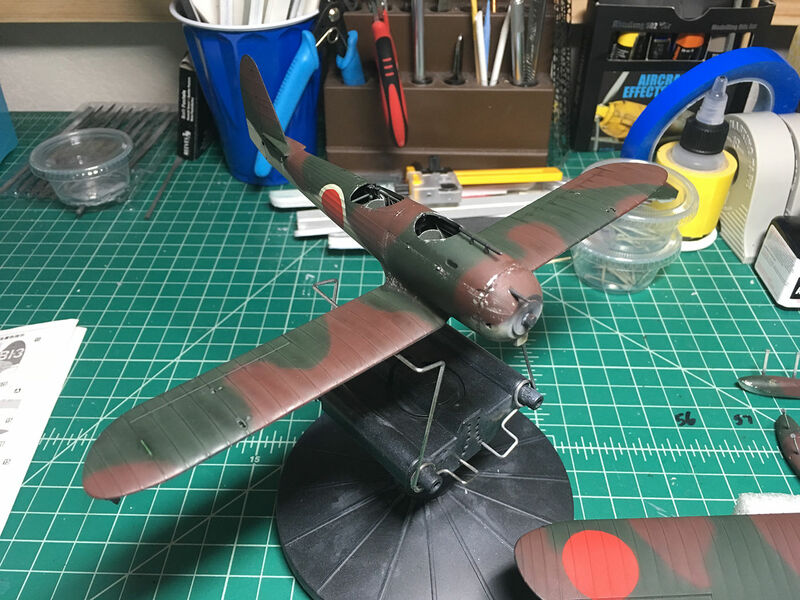 Thanks for a well-done WIP thread. And those blown-white background pics at the end are very well done, too. Mark: Beautiful work!!! 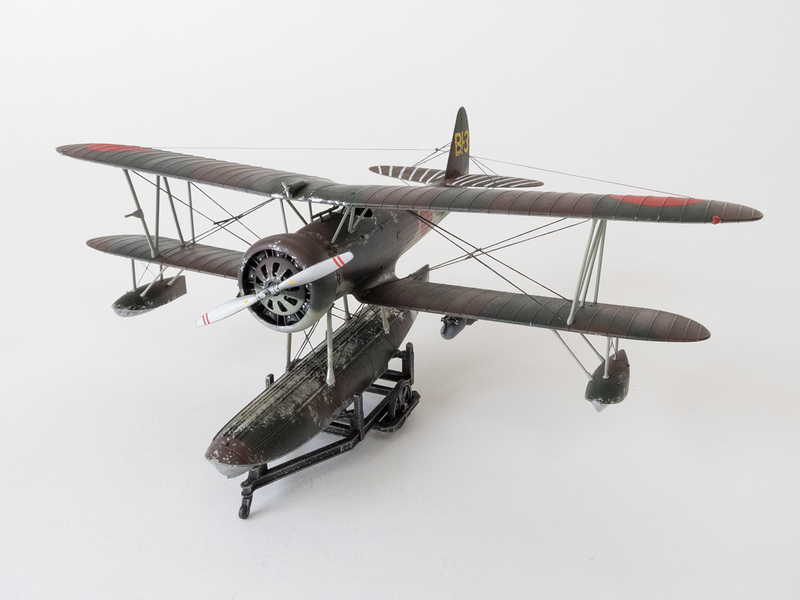 The weathering, camo, rigging, white lines on the stabs- it all turned out fantastic!!! I've heard of people using a Sharpie marker to colour the white rigging. Haven't tried it myself though. All of the above! 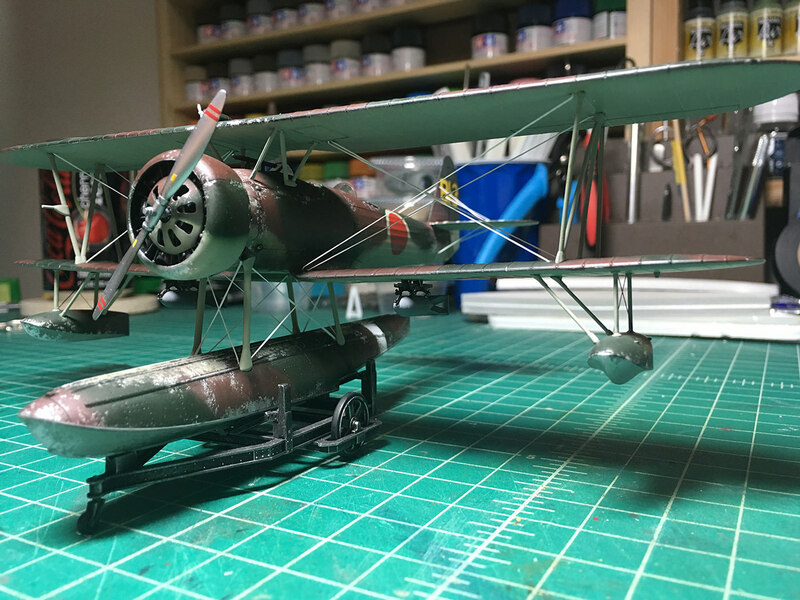 Great WIP and Photos and an outstanding model. Good to see you back on the bench! Thanks Greg. I have a table on the opposite side of the room from my workbench, with a big white piece of paper draped onto it. Thanks to the window just to the left of it the sun provides all the fill light I need, along with one key light (daylight color temp) in front of the subject. 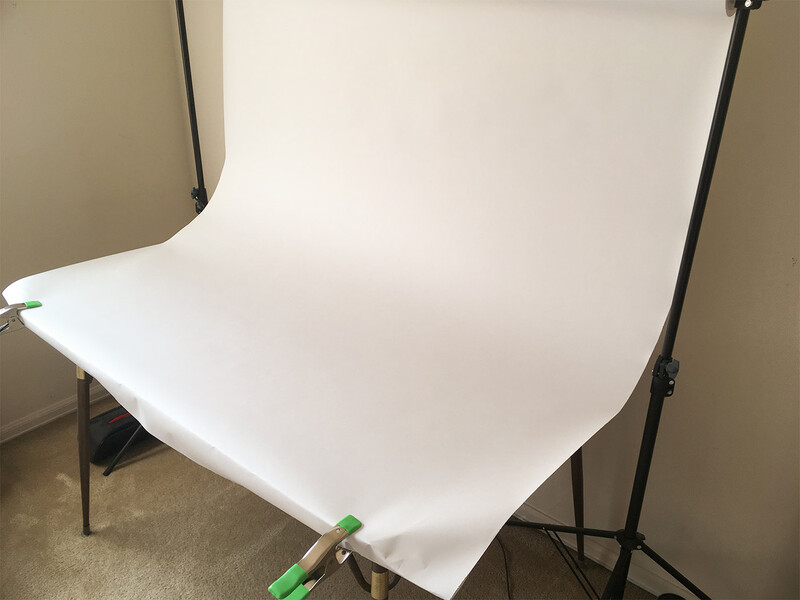 Occasionally I will tweak exposure in Photoshop, but usually don't need to with this setup. Thanks Gamera. That's an interesting idea. I don't have anything else in the stash that requires rigging, but next time around I'll give that a test. Thanks Mike, glad to be back at it. Thank you Chris. It is unusual, makes it really stands out sitting next to all my other builds. This is really cool. Really nicely done overall, and great to see something a little different from the usual roundup. Yep, float planes are really neat!